Learn how to do a Kindle Fire reset to factory defaults with this step-by-step tutorial. Being able to restore your tablet may be something you have to do if you are experiencing a serious Kindle Fire problem, forgot your password, or if you want to wipe it clean 'cause you'll no longer be using it. If your tablet is locked up, won't turn on, or charge, first try to reset your Kindle Fire. This is a basic reboot to turn your tablet off and then back on. It's also an easy solution that fixes a number of problems and won't wipe all the data from your Kindle Fire. The MOST important thing to know about doing a Kindle Fire reset to factory defaults is that your tablet will be WIPED CLEAN. This means it will return to its original state when you first bought it (except for any physical wear and tear, that is). It will no longer be registered to your Amazon account, and all of the content (apps, games, videos, docs, books, etc) that you download, sideloaded, emailed, or added in any way to your Kindle Fire will be gone! Also, all customizations, game data, stats, bookmarks, etc will be erased. Of course, you can re-register the Kindle Fire to your Amazon account and download any content that is in your cloud. Any book or game data that uses Amazon's Whispersync feature will also be available. Disclaimer: I cannot be held responsible for any loss due to resetting your Kindle Fire. The steps in this article are the same for each Kindle Fire. However, the images shown here are from my HD and will be slightly different for those who use the original Kindle Fire. First I'll show you how to do a basic Kindle Fire reset to factory defaults. Next we'll go over how to reset your tablet if you forgot your password. Before we begin, did you read my entire warning above? 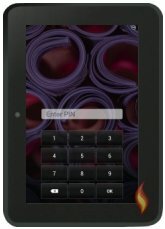 Do you fully understand that resetting your Kindle Fire to factory defaults will restore the tablet to its original baby status (i.e. before you had it in your hot little hands)? If so, then you may proceed. I personally needed to do a Kindle Fire reset to factory defaults when my HD tablet started to run really slow and kept freezing up. I don't know what was causing the problems, but after testing and troubleshooting for a few weeks I gave in and reset it. Although it was a pain to re-download my content and customize everything just the way I like it, it was worth it in the long run. Now it's back to normal! Yippie! 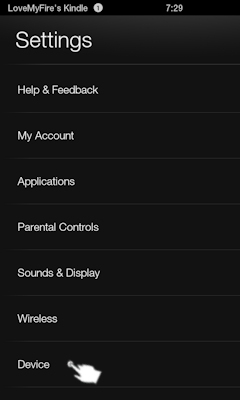 At the very bottom you'll see the option, "Reset to Factory Defaults". Underneath it says, "Removes all personal data from your device." 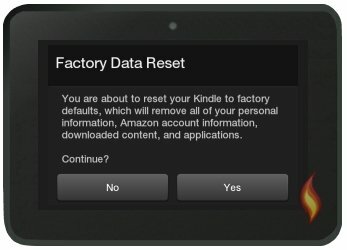 The "Factory Data Reset" warning box opens up and says, "You are about to reset your Kindle to factory defaults, which will remove all of your personal information, Amazon account information, downloaded content, and applications. Continue?" 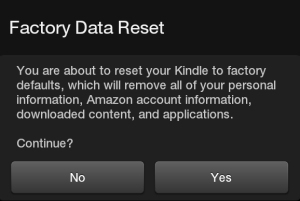 If you are 100% positive you want to do a Kindle Fire reset, go ahead and tap "Yes". If you're not sure, tap "No". It will take a few minutes to finish restoring your tablet to its basic state, and if I remember correctly it will also reboot itself. That's all there is to it. Congratulations! You Kindle Fire has now been reset to factory defaults! Forgot Your Password? 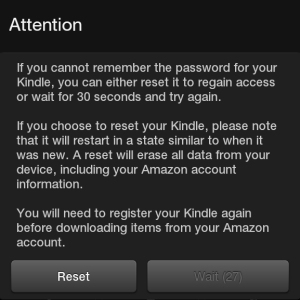 Reset Your Kindle Fire! Unfortunately, if you've forgotten your lock screen password there's only ONE way to get back into your tablet: your have to reset your Kindle Fire. Yep, it's harsh, but Amazon's given us no other way (that I know about) to retrieve a forgotten password. So here's what you do. Try to enter a four digit pin at least five times. Each time you enter the wrong password, it will say, "Please try again". If you suddenly remember your password, you'll have to patiently (or not so patiently) wait until the "Wait" button finishes counting down and changes to the "Try Again" button. Then go ahead and tap "Reset". Now that you're done, how about checking out some cool Kindle Fire apps or fun games to download onto your nice clean tablet? 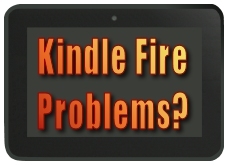 Or, if you're having a different Kindle Fire problem be sure to check out my other resources.